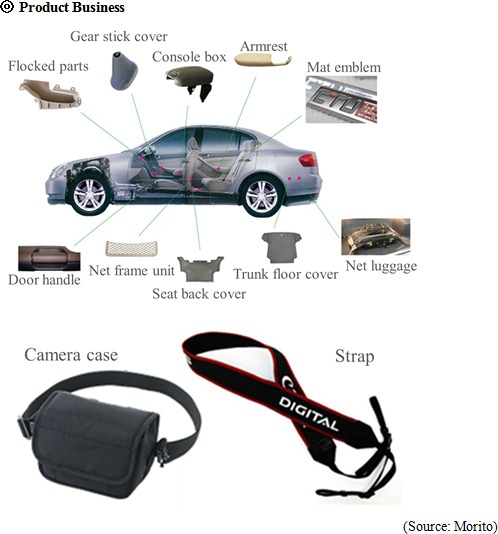 Wholesale of clothing materials, automobile interior parts, camera materials, etc. Planning and manufacturing of products. Production in China. Worldwide sales channels. *The share price means the closing price on Jan. 22. No. of shares issued taken from the latest brief financial report. (No. of treasury shares excluded.). ROE and BPS are the values as of the end of the previous term. 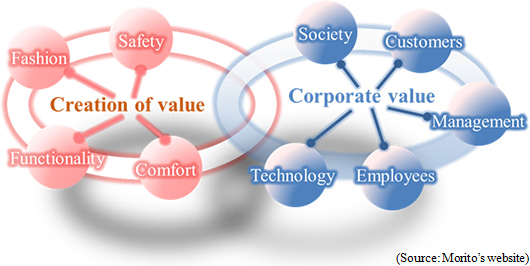 *The values for the term ended Nov. 2014 were estimated by the company. We will briefly report the financial results for the term ending November 2016 and introduce the Seventh Mid-Term Management Plan, etc. of Morito Co., Ltd., which was listed in the second section of Tokyo Stock Exchange. Morito is a specialized trading company that engages in the entire process of planning, developing, manufacturing, wholesaling, and distributing automobile interior parts and clothing accessories, including hooks and eyes, hook-and-loop fasteners, and "eyelets," which are metal rings for lining a hole for laces on shoes, clothes, etc. Through its history of over 100 years, the company has developed the deep trust of customers, high market share with a wide array of products, global networks, etc. As of the end of November 2015, there are a total of 14 consolidated subsidiaries, 4 domestic and 10 overseas. The founder Jukichi Morito, who had worked for a draper's shop in Osaka as an employee, started a one-man company called "Morito Shoten" in 1908, brokering the trade of eyelets, hooks and eyes. In the Taisho period, the western fashion spread, boosting the demand for shoes and allowing the company to grow rapidly. In 1937, the company internationalized its business by exporting hook-and-loop fasteners to Sumatra and Java, and shoelaces to Johannesburg in South Africa and the U.K. After the Pacific War, the company started selling colored nylon fasteners and hook-and-loop fasteners®. In the 1990s, the company launched the business related to consumer goods, such as automobile interior parts and camera straps, with the aim of promoting general-purpose materials, and expanded its business domain. The company also conducted overseas business actively. In 1989, the company was listed in the second section of Osaka Securities Exchange, and in July 2013, it was registered in the second section of Tokyo Stock Exchange, as Tokyo Stock Exchange and Osaka Securities Exchange merged. The business of Morita can be classified into two realms: 1) The "apparel component business," which handles clothing accessories, such as eyelets, hooks and eyes, buckles, and fasteners, and 2) The "product business," which handles automobile interior parts, such as mat emblems and door handles, the nets for the seats of bullet trains, the straps for cameras and mobile terminals, and foot-care products, such as the secondary materials and insoles of shoes. In both businesses, the company conducts the entire process of planning, development, manufacturing, distribution, and sale of products, according to markets and customers' needs, while considering fashion, functionality, comfort, safety, etc. Morito not only delivers automobile interior parts, such as mat emblems, door handles and armrest, nets for the seats of bullet trains, straps for cameras and mobile terminals, etc. to automobile parts manufacturers, image-related electronics manufacturers, etc., but also sells foot-care products, such as secondary materials, insoles of shoes, and shoe cream, as its original brands. As for the composition of sales, the transportation equipment business accounts for about 20%, the business of video equipment materials, including peripheral devices for PCs, makes up about 60%, and the foot-care business about 20%. As for the transportation equipment business, the automobile-related business accounts for about 90%. Toyota-related clients occupy 50% of them, Nissan-related ones 30%, and Honda-related ones 10%. As for the business of video equipment materials, the products for Canon account for 35%, and those for Nikon make up 30%. Other clients include Olympus and Kyocera. As described in the section of corporate history, Morito has been operating apparel component business since its inception, by handling eyelets, hooks and eyes, hook-and-loop fasteners®, etc. The company increased the purposes of use of general-purpose materials, and launched the product business, whose business scale is now nearly equal to that of the apparel component business. When considering just one among Morito's many products, there are always some competitors, but Morito is the only one company in the world that handles such a variety of products, deals with all processes, including planning, development, manufacturing, distribution, and sale, and has sales exceeding 30 billion yen. For the term ended November 2015, which is the last fiscal year in the Sixth Mid-Term Management Plan, the company aimed to achieve an ROE of 5%, but it was not able to reach this value, although its performance improved from the previous term. In the Seventh Mid-Term Management Plan, a target value is not specified, but the company will keep efforts to increase ROE. The improvements in margin and asset efficiency will be essential. Sales were 43,293 million yen, up 20.7% from the previous term. The increase in sales was slight in Japan, but Scovill, which was obtained through M&A, contributed to the good performance in Asia, Europe, and the U.S.
Operating income was 1,721 million yen, up 20.4% from the previous term. SG&A expenses augmented 20% due to the reorganization of Scovill and Matex into subsidiaries, but the growth of sales offset this augmentation. Since exchange gain decreased 111 million yen, the growth rate of ordinary income was low at single-digit levels. As the Chinese automobile interior parts factory run by a joint venture (Morito's ownership ratio: 51%) was transferred, a loss on liquidation of affiliated companies amounting to 458 million yen was recorded as an extraordinary loss, but there were the gains from the sale of noncurrent assets and investment securities amounting to 337 million yen and 699 million yen, respectively. Consequently, net income rose 12.7% from the previous term. Sales grew 3.5% while profit declined 1.5% from the previous term. The sales of accessories for major mass retailers and sports apparel manufacturers in Japan, Europe, and the U.S. increased. The sales of the accessories for stationery and teaching materials, including school bags, the OEM products of camera accessories, and shoes grew. Sales and profit grew 37.5% and 25.6%, respectively, from the previous term. The sales toward European and U.S. manufacturers of babies' wear and casual outer clothes manufacturers in Hong Kong increased, and the performance for the needlework of sports shoes was healthy. The sales of camera accessories in Hong Kong and Thailand, and the automobile interior parts for Japanese automobile manufacturers in Shanghai increased. The results of Scovill in Hong Kong and India have been newly included in consolidated results (Sales: 1.7 billion yen). Sales and profit grew 168.7% and 150.5%, respectively, from the previous term. The sales of medical clothing accessories in Europe and the U.S. grew, and the sales of the accessories for working wear in Europe increased. The sales of automobile interior parts toward Japanese automobile manufacturers in the U.S. grew. In Europe, the sales of automobile interior parts toward European automobile manufacturers and camera accessories increased. Due to the increase in cash and deposits and trade receivables, etc., current assets grew 1.9 billion yen from the end of the previous term. Because of the acquisition of the trademarks of Scovill, etc., intangible fixed assets grew 500 million yen from the previous term, but noncurrent assets dropped 200 million yen due to the decrease in investment securities, etc. Accordingly, total assets grew 1.7 billion yen to 47.3 billion yen. Due to the increase in corporate tax payable, etc., current liabilities augmented 400 million yen from the previous term, while noncurrent liabilities decreased 200 million yen because of the drop in long-term debts, etc. As a result, total liabilities augmented 100 million yen to 16.2 billion yen. Net assets increased 1.9 billion yen to 31.1 billion yen, because of the increases in retained earnings and foreign currency translation adjustment for the yen depreciation, etc. Consequently, equity ratio was 65.7%, up 1.0% from the end of the previous term. Operating CF increased further from the previous term, due to the growth of profit, depreciation, goodwill amortization, etc. Investing CF became positive, due to the sale of investment securities and property, plant and equipment, etc. Free CF, too, became positive. Financing CF became negative, as short-term debts augmented and there were no proceeds from long-term debts. Cash and cash equivalents increased 2.0 billion yen from the end of the previous term. The synergy with Scovill, which was reorganized into a subsidiary through the first cross-border M&A for Morito, is emerging in the following three aspects. The warehouse of Scovill UK was closed and integrated into the warehouse of Morito Europe. In the Seventh Mid-Term Management Plan, the two companies' business facilities are to be integrated in the U.S. and Hong Kong. These are expected to reduce costs steadily. The metal and resin accessories that have been procured by Scovill through outsourcing will be produced in the Morito Group's factories or affiliated ones at lower costs. This is expected to boost operating income in the entire corporate group. This will be started in full swing during this term. This is expected to increase sales and profit for the entire corporate group, mainly those of metal and resin accessories for European and U.S. apparel manufacturers. At the meeting of the board of directors on January 14, 2016, the company resolved to increase the term-end dividend for the term ended November 2015 from the earlier estimate of 7.00 yen/share to 7.50 yen/share. The estimated annual dividend has been increased from 14.00 yen/share to 14.50 yen/share. In this term, which corresponds to the first fiscal year of the Seventh Mid-Term Management Plan, the company will develop added value products originating from Japan, expand the revenue base through global business operation, challenge the uncultivated markets, maximize synergetic effects, etc. Sales are estimated to be 45 billion yen, up 3.9% from the previous term, and operating income is estimated to be 2 billion yen, up 16.2% from the previous term. As for dividends, interim, term-end, and annual dividends are estimated to be 8.00 yen/share, 8.00 yen/share, and 16.00 yen/share, respectively. The dividend will increase by 1.50 yen/share from the previous term. The estimated payout ratio is 30.7%. Following the Sixth Mid-Term Management Plan, which ended in the previous term, the company decided to aim to improve its corporate value and contribute to society, and designed "the Seventh Mid-Term Management Plan: Make it happen. We will build our future on our own!!!" The Sixth Mid-Term Management Plan (from the term ended November 2011 to the term ended November 2015), whose basic policy is "to aim to grow as a global enterprise," resulted in the following. Both sales and profit increased steadily. Morito acquired the two companies that handle secondary apparel materials (Scovill in the U.S. and Matex in Japan). 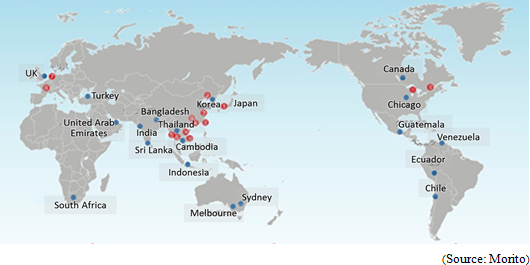 Morito established new bases in China (Shenzhen), the U.S. (Michigan and Tennessee), Vietnam (Da Nang and Ho Chi Minh), Myanmar, and Thailand, to expand its business. Through consolidation of facilities, Morito's business operation was streamlined. At present, Morito has 8 bases in Japan, and 4 bases outside Japan. The dividend was increased for 5 consecutive years. The dividend for the term ended November 2015 was 14.50 yen/share, marking a record high. At the end of November 2014, the company resumed the Shareholder Special Benefit Plan, which had been suspended since the term ended November 2008. The company bought 500,000 treasury shares at 500 million yen by February 2016. Morito set the three managerial objectives: (1) to expand and fortify the revenue base of the corporate group, (2) to establish capital measures, and (3) to strengthen internal control systems. Morito aims to become a more competent and resilient company. The company also finds it necessary to clarify the roles of each business base. The company finds it important to develop new products originating from Japan and to improve added value. For further globalization, the company finds it essential to recruit and develop local executive staff. Starting from the current term, the "apparel material-related business" and "customer goods-related business" were renamed the "apparel component business" and "product business," respectively. Considering market trends and Morito's strengths, the company will select 14 target fields, prioritize these target fields, and implement group-wide strategies. The company thus far has had high market share in part of the "luxury" price range and the "middle high" price range. From now on, the company plans to maintain "middle high" as its most important price range, while at the same time increasing its share in the "luxury" and "middle low" price ranges, too, by adding targets, expanding the product lineup, and enhancing sales capabilities. While pursuing the quality of its core products, including hooks and eyes, eyelets, and hook-and-loop fasteners, the company will make efforts to increase highly functional products and develop new products. In addition, the company will review its brands from the global viewpoint, and consolidate them. The company will improve not only its products, but also its systems for providing them. Specifically, it will establish new bases, expand the human resources, strengthen the cooperation with Scovill, promote alliances and M&A, strengthen the activities with domestic enterprises that conduct global business operations, attend to inbound clients, and secure competitive advantages by improving after-sales services, etc. The primary measures are to expand the markets in China, North and Central Americas, improve the capability of global procurement and quality assurance, and strengthen quality, cost, delivery (QCD) competitiveness at priority bases, etc. The company will set target fields to narrow down clients, and pursue added value by utilizing its own factories. It will also streamline its operations by concentrating its managerial resources. As the company currently handles mainly men's shoe-related products, it will broaden its domain to handle women's products and high-priced sundries. Then, it will develop systems for responding to the purchase behaviors across the border between the Internet and the real world. In addition, the company will develop systems for overseas business operation mainly in China. When designing the Seventh Mid-Term Management Plan, Morito put the highest importance on "raising employee awareness." The trust and achievements built by Morito in its long history of over 100 years are intangible yet important assets, and the company has never had a deficit. Therefore, the management considers that employees lack the ambition for changing themselves or the company. The management finds it the most necessary to raise the employees' awareness for creating new value on their own responsibility and for enabling the company to keep growing. These thoughts were put into the mottoes: "Make it happen. We will build our future on our own!!!" and "Actualization of the new 'Morito Group' that can create existence value." As concrete measures, the company plans to fine-tune personnel evaluation systems based on the awareness enhancement, send company-wide messages repeatedly, and introduce stock options for all employees. We would like to see what the awareness enhancement will bring.